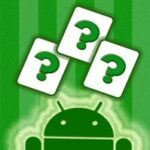 A detailed review of Video Poker Assistant, a customizable casino strategy app for Android smartphones and tablets. Thousands of people play real money video poker at online casinos. Among them, only a minuscule fraction incorporate a proper strategy into their game play. If you want to increase your win ratio, you’ll need to learn how to play like pros. In the past, people relied on strategy guide books written by professional gamblers and mathematicians. Most of them only applied to a single variation of video poker, with a fixed paytable. Today’s games come in all shapes and sizes, making books all but obsolete. Thankfully, modern technology is solving that problem. Today, we’re going to talk about a free video poker strategy app that allows players to choose from the two most common video poker games, and customize the paytables. It’s called Video Poker Assistant, and is available on the Google Play Store for smartphones and tablet running Android 2.2+. When you first open the app, you’ll have the option to start in Practice mode or Simulator mode. Before you do, take a quick look at the Settings. Here, you can adjust simulation time, the number of credits you start with, and can even manipulate the shuffling engine. Doing so will let you increase the odds of being dealt certain starting hands, like high ranking cards, wilds, pairs, and hands with 3+ cards to a straight or flush. This may sound like cheating, but remember, the purpose is to learn how to play these hands when they come along. Knowing the odds of being dealt the right cards following the draw is key to playing with an optimal video poker strategy. You can adjust your bet with the Bet button, then press Deal when ready. 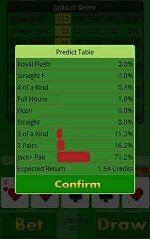 Once the initial 5 cards are drawn, you can press the Predict button to see which hands are most likely to occur, at what percentage rate, and the expected return on the bet based on those credentials. I suggest selecting the cards you wish to Hold, then press Predict to see if you made the right choice. In Simulator mode, you’ll actually be able to test the results of specific hands. You’ll start by selecting the 5 cards you want to start with (or press Random to have cards chosen for you). 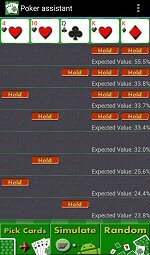 The next screen shows a complete chart of what you can expect to happen if you hold different card values, in order of most likely to produce the best return. This is by far the best feature of the casino strategy app. With this Android app at your side, you can actually play video poker for real money, inputting your cards into the app as you go. Of course, learning and memorizing the proper moves is the ultimate goal. But with Video Poker Assistant, even a novice strategist can employ the right tactics every time. Yes, there is definitely room for improvement here. A larger variety of games would be phenomenal. A strategy test that tells you whether you made the right or wrong choice would also be nice, but the ‘Predict’ button does supply this to some extent. A quick edit by a fluent English speaking person would also be a nice touch. Overall, though, I think it’s a great little program, at a great little price – free!